DXN Vinaigrette rice vinegar with Ganoderma contains organic acid. 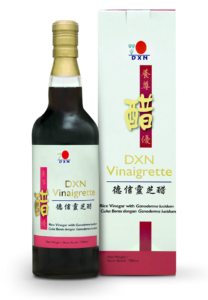 DXN Vinaigrette is a special rice vinegar with Ganoderma lucidum. It is fermented for years using traditional techniques to preserve its distinctive flavour and quality. It is suitable for salads or you may take it with water: 2 – 4 times per day (5ml DXN Vinaigrette + 200ml water). It can be taken before or after meals. What is the recommended consumption per day? Daily recommended consumption is 2 – 4 times per day (5ml DXN Vinaigrette + 200ml water). Any expected side effect after consuming this product? This product is 100% natural. Usually there is no side effect. However if you are consuming other cholesterol lowering medicines or taking other medications for long periods, kindly consult your doctor before taking it. Any group of people who should not consume this product? In general, everybody can consume this product as it is basically a type of food. Is this product suitable for pregnant women? It is a common idea not to over consume anything during pregnancy. As a rule of thumb, always seek professional medical advice before starting food supplements or health drinks during pregnancy. Is there any consumption limitation to children? Children can consume half the daily recommended consumption compared to adults. Is it suitable for people with gastric problem? If yes, what sort of advice should we give them?DXN Vinaigrette contains organic acid, but not synthetic acid, which is unlikely to induce gastric problem. Nevertheless, for those with gastric problem, they are advised to consume this product after meals. It will not affect the product effect. Acetic acid concern: From time to time, will the amount of acetic acid increase? No. DXN Vinaigrette has reached its maturity stage when it is filled into bottles, thus, the amount of acetic acid will remain unchanged. Is acetic acid good for health? Yes. Natural acetic acid in DXN Vinaigrette can promote efficient energy burning in our body and restore the body pH to mild alkaline. Will there be any effect to the quality if there are changes in the colour and taste? No. Due to natural fermentation, the colour and taste may have slight changes from batch to batch. Will there be any sediment? There is a possibility of sediment being present in DXN Vinaigrette. The sediment is a by-product of yeast fermentation and is in fact good for health. Can you recommend other consumption method of DXN Vinaigrette? Yes. Honey or other fruit juice can be added to enhance the taste. Since this is also a fermented product, what is the difference between Cordypine and DXN Vinaigrette in terms of benefits / process? Do both provide the same benefits? Cordypine consists of pineapple and Cordyceps. 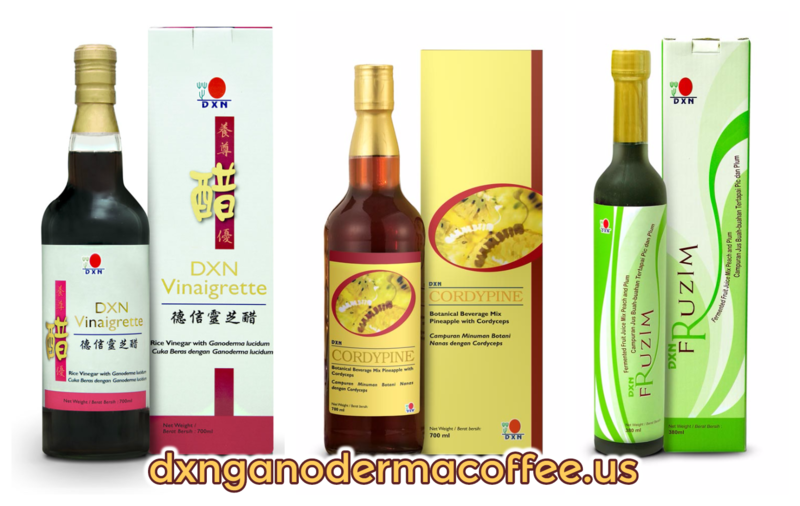 While DXN Vinaigrette consists of rice vinegar from Monascus and Ganoderma. As both are using different raw materials, thus the benefits obtained are different. What is the difference between DXN Vinaigrette and DXN Monascus? DXN Vinaigrette contains fermented red yeast rice and Ganoderma whereas DXN Monascus contains red yeast rice as its sole ingredient. DXN Monascus is available in capsule form which is more convenient to be consumed while travelling. From the functional aspect, DXN Vinaigrette is an alkaline drink which keeps your body pH balanced and gears up your energy all day long whereas Monascus is mainly used to regulate blood cholesterol level while. Why does DXN Vinaigrette has colour of amber brown but not red when Monascus is used in the fermentation? The amber brown colour of DXN Vinaigrette is due to the fermentation process which has reached its maturity stage. Besides, the addition of Ganoderma also contributes to its amber brown colour. Can it be used for cooking purposes? Yes, it helps to enhance the taste and flavour of your cooking. What are the differences between DXN Vinaigrette and those commercial vinegar? There are several types of vinegar in the market. There are mostly made from chemically synthesized acetic acid. DXN Vinaigrette is a pure organic vinegar. During the process, high quality glutinous rice is fermented with Monascus for three years without addition of chemical to accelerate the fermentation process. This unique natural fermentation method leads to the distinctive flavour and aroma of DXN Vinaigrette. Besides, addition of Ganoderma gives extra benefits in maintaining the overall well being of our health. Is it suitable for those with fungal infection? Many researches showed that fungus strive in acidic body condition. DXN Vinaigrette helps to balance the body pH to mild alkaline condition which does not favour the growth of fungus. These questions and answers are from the official DXN Malaysia homepage. You should check if it’s avaible in your country. If not, you may use other DXN products with enzyme. 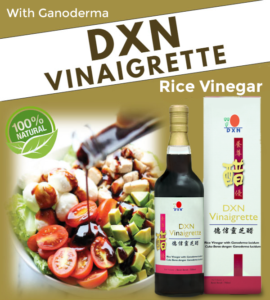 DXN Vinaigrette is made from selected rice vinegar and Ganoderma lucidum. Packaging size: 285ml per bottle and/or 700ml per bottle. DXN Fruzim is a nutritious enzyme drink naturally fermented from peach and plum. Packaging size: 380ml per bottle. The above mentioned products are food, beverages or herbal food supplements designed to assist in the maintenance of general well- being through regular use. The information have not been evaluated by the Food and Drug Administration. These product are not intended to diagnose, treat, cure, or prevent any disease. DXN does not condone or advocate self-diagnosis or self-medication in any way. If you have a condition which requires medical diagnosis and treatment, it is important that you visit your healthcare professional.